Join us to celebrate the release of Susan Crawford's Captive Audience: The Telecom Industry and Monopoly Power in the New Gilded Age. Crawford uses the 2011 merger between Comcast and NBCU as a framework to explore how deregulatory changes in policy have created a communications crisis in America. 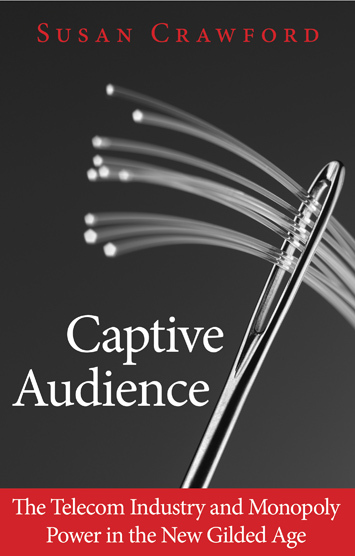 From smartphones and television programming to the cost of high-speed Internet access, Captive Audience illustrates that in the Internet era, a very few companies control our information destiny. The consequences: Tens of millions of Americans are being left behind, people pay too much for too little Internet access, and speeds are slow. But everyday people can change this story - and what happens in the year ahead could change the game for good. Susan Crawford is the (Visiting) Stanton Professor of the First Amendment at Harvard’s Kennedy School, a Visiting Professor at Harvard Law School, a Professor at Cardozo Law School, author of Captive Audience: The Telecom Industry and Monopoly Power in the New Gilded Age (Yale 2012) and regularly contributes to Bloomberg View and Wired. She served as Special Assistant to the President for Science, Technology, and Innovation Policy during 2009 and co-led the FCC transition team between the Bush and Obama administrations. Crawford is a Fellow at the Roosevelt Institute, where she leads the Institute's work on making high-speed Internet access a universal, affordable resource for all, and a member of Mayor Michael Bloomberg’s Advisory Council on Technology and Innovation. Ms. Crawford was formerly a professor at the University of Michigan Law School (2008-2010). As an academic, she teaches open government policy, Internet law, and communications law. She was a member of the board of directors of ICANN from 2005-2008 and is the founder of OneWebDay, a global Earth Day for the Internet that takes place each Sept. 22. One of Fast Company’s Most Influential Women in Technology (2009); IP3 Awardee (2010); one of Prospect Magazine’s Top Ten Brains of the Digital Future (2011); one of Newsweek's 100 Digital Disruptors (2012). She serves on the boards of Public Knowledge and TPRC and as a faculty co-director of the Berkman Center at Harvard. Ms. Crawford received her B.A. and J.D. from Yale University. She served as a clerk for Judge Raymond J. Dearie of the U.S. District Court for the Eastern District of New York, and was a partner at Wilmer, Cutler & Pickering (now WilmerHale) (Washington, D.C.) until the end of 2002, when she left that firm to enter the legal academy. Susan lives in New York City and Cambridge, MA.